I’m not sure about foxing, but I know page tanning (where the pages turn that lovely yellow-brown color and become brittle) can be curtailed with the use of acid-free paper. Most publishers in the States print books on this type of paper, but I’m not sure if that’s the case with publishers located abroad. Hi Jenn, I know about tanning as well. I should have mentioned that! I also should have mentioned that most of the books that I own are US or UK editions and only a handful were printed in the Philippines. So most of my books are probably published on acid-free paper as well but they still get foxed. That’s why I think the weather and climate have something to do with it. I don’t really have that problem with my books… but I do live in a desert. Most of my book problems consist of friends not giving back books they’ve lent to me. When I lived in Sri Lanka, we had issues where mold would grow on VHS eventually and make tapes go bad, but not this issue with books. Maybe try.. a desiccant like silica gel packets around your books to remove humidity? That’s all I got. We used to save silica gel from food packaging, take it out of the packets, and then heat it up so that it would turn from saturated (from the moisture) and reuse them (mom would make sachets of them with scrap fabric). Apparently a lot of cat litter uses silica gel so so that might be a way to get it cheap. Or google “desiccants” and see if there’s something else that can be used. Or I guess … a dehumidifier? I don’t know how easy it is to buy one of those in Manila though. I never heard of them till I came to the U.S.
Oh nevermind, you already tried the closet dehumidifiers! Man, this is a tough one. Hmm I can’t remember if we had issues with VHS tapes. I never kept a lot of those so I didn’t notice. I’ve always had books and some of my oldest ones have been given away because they’ve turned yellow with age and it’s not like I’ll be able to reread them. I haven’t tried those silica packets but that has been suggested before so maybe I should give them a try. Yep, I’ve tried closet dehumidifiers. They get filled up with water pretty quickly and have to be changed on a regular basis. So now that I’m away from Manila, I don’t leave a dehumidifier there because it will just become a breeding ground for mosquitoes. 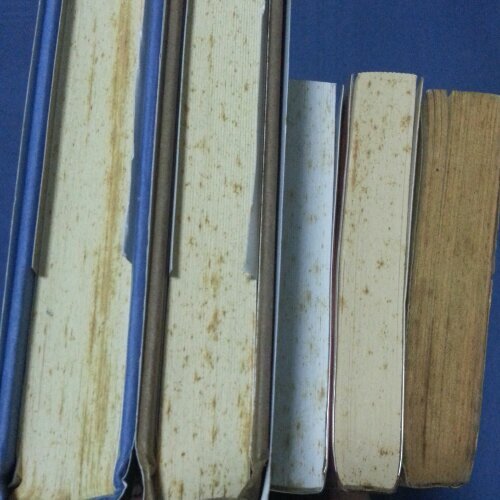 Even my oldest books show yellowing, but no foxing. It’s certainly humid enough during the summer, but I do run the AC. 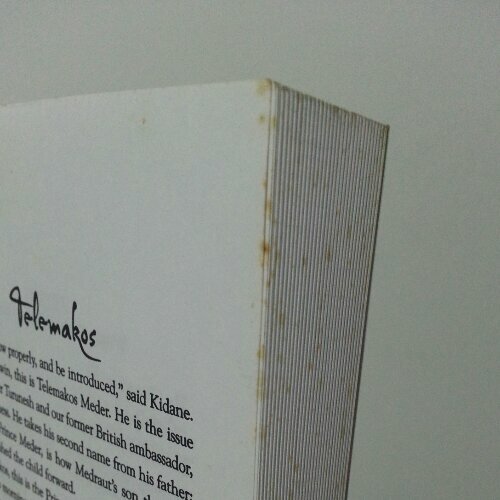 Good luck keeping your books in good shape in Singapore! Really, no foxing? So maybe the yellowing is a normal thing then. It’s just the foxing that’s more unusual. Thanks, I’ll do my best. 🙂 I really should make more of an effort to get ebooks and maybe just keep signed paperbacks and hardcovers. I should pass on some of my other books so people can enjoy and appreciate them before they get damaged by heat and humidity. Hi Vanessa, thanks for dropping by to comment! I appreciate it. 🙂 I’m jealous that you don’t have to worry about your books turning yellow or getting foxing! I’ve never been to Canada but it probably has a similar climate to the States, where the air is very dry? That’s so different from the tropical weather here in Singapore (and also in Manila). 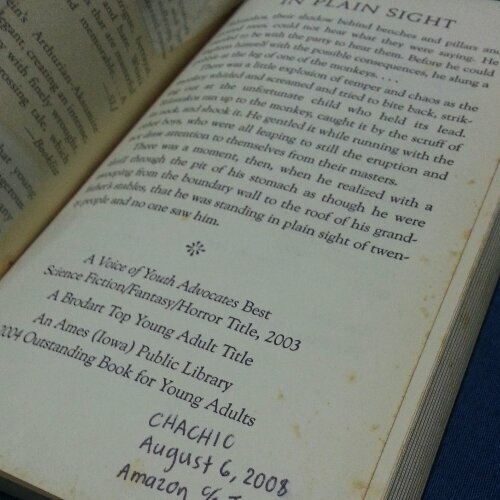 It really makes me sad that I have to worry about the condition of my books as they get older. Yep, I found out the word for it a few years ago when I started worrying about my books getting these spots. I know exactly what you mean – the aging is different for each of my books even though they’re all kept in the same bookshelf. I think it also depends on the paper quality and maybe how exposed the books are to the humid air (whether there are glass covers, etc.) The cling wrap idea will work, I guess. That’s why when I buy books and they’re still wrapped in plastic, I don’t remove the plastic sheet until I’m about to read the book. I recently read a book that I bought in 2007 and it was in excellent condition because of the cling wrap. But yeah, I wouldn’t really be able to do that for books that I’ve read and would want to reread. I have the same problem and very scare that my foxed older books will effect my newer books since i only have one book shelve. Is foxing contagious? Hmm I actually have no idea if it’s something that will spread from one book to another. Sorry couldn’t help you with this!